At a May Day entertainment given last year a popular hostess noted the fact that there was repeated controversy among her guests concerning May Day traditions and ancient customs among various nations, which gave her an Idea for this year’s novel May party. She has chosen for her guests all the members of her literary club, and other friends who are fond of literary research and competition. To a certain number she has assigned the task of searching out and describing quaint May Day celebrations whose origins have been lost in the mists of remote antiquity. Others have been requested to describe the customs that have been handed down from our Gothic ancestors. Still others will describe quaint celebrations that have their origin in the Floralia of the Romans. The strange May festivals of the ancient Druids, and the May games which Christianity finally adopted from these, will also be brought up for consideration, with prizes awarded (of course) for the best papers on the various subjects. But the most interesting feature of the entertainment will be the acting out of many curious customs. As the entertainment will be given on the eve of May Day, the festivities will be continued until the “Meeting of the Dew” may be celebrated in the early hours of May Day morning. When the people of ancient Edinburgh used to assemble at Arthur’s Seat to “meet the dew” May dew was thought to possess all kinds of virtues. Even the English girls went into the field to wash their faces in it at dawn, in order to procure a good complexion. Samuel Pepys records in his delightful diary that his wife has gone to Woolwich for a little change of air “and to gather the May dew.” This form of celebration would have to be omitted when the entertainment is given in a city home, but as our hostess has spacious grounds surrounding her suburban house, the “meeting of the dew” will be a novel feature of the celebration. Another quaint festivity that can be carried out on the lawn if desired, but which might also be celebrated as a parlor dance for a city home, is the German Walpurglsnacht, and although the witches may not “ride up the Brocken on magpies’ tails,” their weird dance may be celebrated—the witches who dance on the Brocken until they have danced away the winter’s snow. The “Parade of Sweeps” will be an interesting feature of the entertainment. It is said that the parade of sweeps in bowers of greenery lingered on rather longer in England than May poles. It is supposed to have originated in this way—and this story will be told by one of those to whom the searching for English festivities has been assigned. Edward Wortley Montagu (born about 1714) who later was destined to win celebrity by still stranger freaks, escaped when a boy from Westmont School, and borrowed the cloths of a chimney sweep, in whose trade he became an adept. A long search led to his discovery and restoration to his parents on May 1, in recollection of which event Mrs. Elizabeth Montagu is said to have instituted the May Day feast given by her for many years to the London chimney sweepers. A few of the guests who are humorously inclined will don costumes of the old-time chimney sweeps, and after their mirth-provoking “dance of the sweeps,” will retain the costume while acting the clown during the remainder of the entertainment. The final celebration before the May Day breakfast—which will be served shortly after midnight, in the earliest hours of May Day morning—will be patterned after a quaint custom in Lorraine, in which jokes on individual guests will play an important part. In Lorraine, girls dressed in white go from village to village stringing off couplets in which the inhabitants are turned into somewhat unmerciful ridicule. The girls of this place enlighten the people of that as to their small failings, and vice versa. The village poets harvest the jokes made by one community at the expense of another, in order to shape them into a consecutive whole for recital on May Day. The girls are rewarded for their part in the business by small coin, cakes and fruit. Although the idea of reward and of going from village to village for adaptable jokes will not be carried out, this can be made a charming feature of the festivity. To a number of practical jokers has been assigned the task of forming into laughable couplets all the faults and failings or peculiarities of the various guests, and while the unpleasant sting of personality will be avoided, by omitting mention of any particular guest in connection with the various accusations, there will be continual sport In choosing the guest to whom the joke seems most applicable. 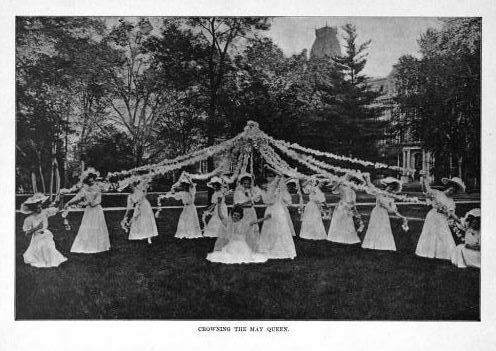 Several quaint old-time dances will be Introduced during the evening; but as no May Day party can be quite complete without the English dance around the May pole, a flower-decked pole will be a feature of the parlor decorations. And after the final May dance in good old English style about this pole, each guest will receive as a souvenir one of its gay silk streamers and a floral wreath or garland. Phebe Westcott Humphreys. Mrs Daffodil’s Aide-memoire: Mrs Daffodil finds the whole thing a contrived, patch-work sort of entertainment. What sane hostess would try to cram academic papers, dew, dancing witches, and the May Pole into a single party? One might even call it a “crazy quilt.” Witches and May Poles and Sweeps, oh my! To be Relentlessly Informative, Mrs. Elizabeth Montague, who died in 1800, gave for many years a May-day entertainment to the chimney-sweeps of London at her house in Portman Square. These sooty guests were regaled with roast beef and plum-pudding, and a dance succeeded, while each of them received a shilling on his departure. 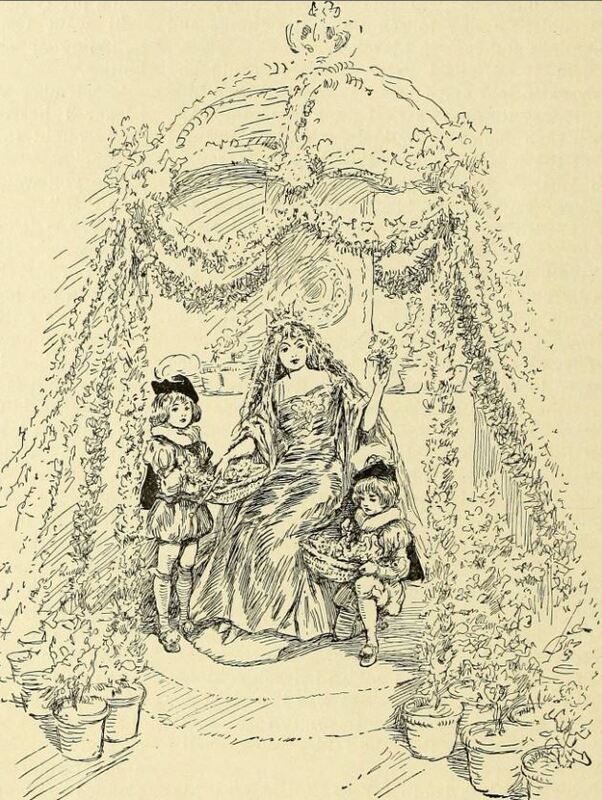 Mrs Daffodil has written before on the Ideal and the Real May Day, as well as some other over-elaborate May Day pageants and a parody of Alfred, Lord Tennyson’s bumpity-thumpity poem, The May Queen, adapted for inclement weather, as is Britain’s wont on that day. This entry was posted in Dance, Edwardian, Fancy Dress, Frolics, Holidays, News and Announcements and tagged Brocken witches, chimney sweeps, May Day, May Pole, May Queen, Meeting the Dew, Mrs Elizabeth Montague, Parade of Sweeps, Walpurgisnacht on April 29, 2018 by chriswoodyard. Our American cousins , too, took up the flowery garlands of the celebration, adding little touches of their own to the festival. One fears they did not fully appreciate the pagan undertones of characters like “Jack-in-the-Green” or “Robin Hood.” However, perhaps subliminally, they acknowledged the propriety of using the imagery of a Spring Fertility Festival for a bridal shower. “Perky” May-Pole, indeed…. The Indians call the month of May the “Time of the Flower-Moon.” Just as April is filled with rain showers, May is the month for bride-showers, following the order of the flower-moon preceding the honeymoon for the June bride. A luncheon shower is a pleasing way of entertaining the bride-to-be. The table can be decorated effectively with a pink and green May pole for a centerpiece, its flower streamers in corresponding colors draped down to different places on the table. At the end of each, folded in pink paper blossoms, are little notes, preferably in verse, directing the bride-to-be to different part of the house (on the mantel, behind the phonograph, and so on), each a hiding place for a dainty gift for the bride—flowered lingerie, smart china, or any gift that carries out the flower motif. Miniature May poles made of striped candy sticks and ribbons, with the guest’s name written on a flat card to which the stick is fastened, will serve as place cards, and you may have pretty little “May baskets” filled with candy at each cover. If you are serving your guests at small tables, there may be different centerpieces for each table. “Jack-in-the-green,” a clown, dressed in pink and green, and hidden in a bouquet of flowers, is charmingly reminiscent of old England. The “Lady of the May,” a child’s doll, decorated with flowers, signifies a popular old custom you might work into your scheme of decorating, or, if you are using a long table, you may have the May pole in the exact center. “Jack-in-the-green” at one end and the “Lady of the May” at the other. Games apropos to the occasion may feature the Robin Hood idea—Robin Hood, you know, always figured prominently in the celebration of the first of May. Tiny bows and arrows and a flower-decorated target will furnish amusement—with a gay May basket, some tiny present hidden beneath its flowers, for a prize. And nothing would be more fun or more appropriate than to crown the bride-to-be “Queen of the May” during your party. Mrs Daffodil’s Aide-memoire: It really is rather extraordinary how long even bowdlerised and ill-understood versions of the May-Day Festivities survived. Even in the United States, May-Pole dances and parties were a staple of young ladies’ academies and, as we have seen, bridal showers. Rather earlier, there was advice on May-Day Tableaux for the young. Mrs Daffodil gives a single sample so as to not weary her readers. Mrs Daffodil is not quite sure when the escalation of May-Day Pageants began, but in this account from 1912, the May Queen is accompanied, not only by the traditional English Robin-Hood and Hobby Horse, but a parade-of-all-nations including (inexplicably) Roman maidens and Japanese girls. Each of the national groups had its own suggested dance figure, song or May-Pole braiding pattern. If one was ambitious and had a stock of willing young ladies, one could reconstruct the entire tedious pageant by consulting this detailed book. Mrs Daffodil wishes her readers the Maddest Merriest Day Of All the Glad New Year. See another May-Day post about a May-Queen controversy. And this, about the ideal vs. the actual May Day. 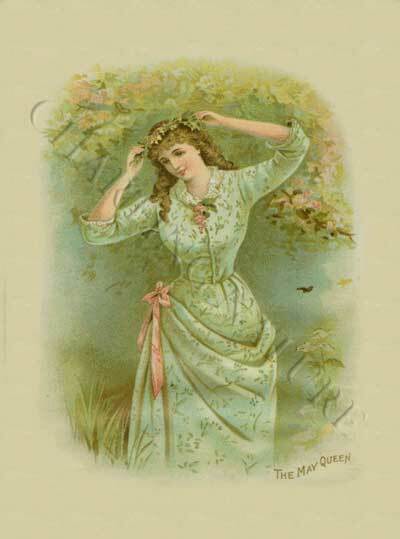 And this parody of the all-too-easily-parodied Tennyson’s “The May Queen,” adapted for inclement weather. This entry was posted in Children, Dance, Edwardian, etiquette, Fads, Fancy Dress, Frolics, History 1910-1930, Holidays, News and Announcements, Victorian, Weddings and tagged Jack in the Green, May Day, May festival, May Pole, May Queen, wedding showers on April 28, 2017 by chriswoodyard. An ideal May Queen’s bower. Considering apology superfluous, Mr Punch offers none, as the Poet Laureate will doubtless approve the modifications of his beautiful lines, rendered needful by recent meteorological conditions. For I’m to be Queen o’ the May, Mother, I’m to be Queen o’ the May. And I’m to be Queen o’ the May, Mother, I’m to be Queen o’ the May. To shiver as Queen o’ the May, Mother, to shiver as Queen o’ the May. As I was coming home to-night whom think you I should see but Doctor Squills! But I’m chosen Queen o’ the May, Mother, so I must be Queen o’ the May. Ain’t it nice for the Queen o’ the May, Mother, so nice for the Queen o’ the May? And with prices up and wages down however will father pay? But I’m to be Queen o’ the May, Mother—oh, bother the Queen o’ the May! That I may look out some winter wraps, fit for the spring this year. Mrs Daffodil’s Aide-memoire: This parody is based on the old chestnut, “The May Queen,” by Alfred Lord Tennyson, which was quoted in the press and recited ad nauseam in drawing-rooms until one wanted to scream. The anonymous Punch contributor has captured perfectly the thumpety-bumpety scansion of the original, which ill-accords with the lingering death-bed and morally uplifting sentiments found in the last two sections of the poem. It was something of a joke that May-day weather in England was always inclement. In 1876 and 1877, records show that the day was either snowy or very wet. Mrs Daffodil has previously posted an amusing cartoon sequence on the Ideal vs. the Actual May-Day, dating from 1878, when the weather continued perfectly foul. Mrs Daffodil notes that the forecast for May-day is anything but sunny. She wishes all of her readers the happiest of times on this, the maddest, merriest day. This entry was posted in Frolics, Holidays, Humour and Satire, Literary, News and Announcements, Victorian and tagged Alfred Lord Tennyson, May Day, May Day weather, May Queen, Queen of the May, Victorian parody, Victorian poetry on May 1, 2016 by chriswoodyard. See last year’s May-Day post about a May-Queen controversy. And this, about the ideal vs. the actual May Day. This entry was posted in Children, Edwardian, Fads, Fancy Dress, Frolics, History 1910-1930, Holidays, News and Announcements, Victorian, Weddings and tagged Jack in the Green, May Day, May festival, May Pole, May Queen, wedding showers on April 30, 2014 by chriswoodyard. Mrs Daffodil’s Aide-memoire: Mrs Daffodil is a bit fogged as to why the English girl won the contest if so many were in opposition to a British Queen. And the wit in the final lines is somewhat obscure. 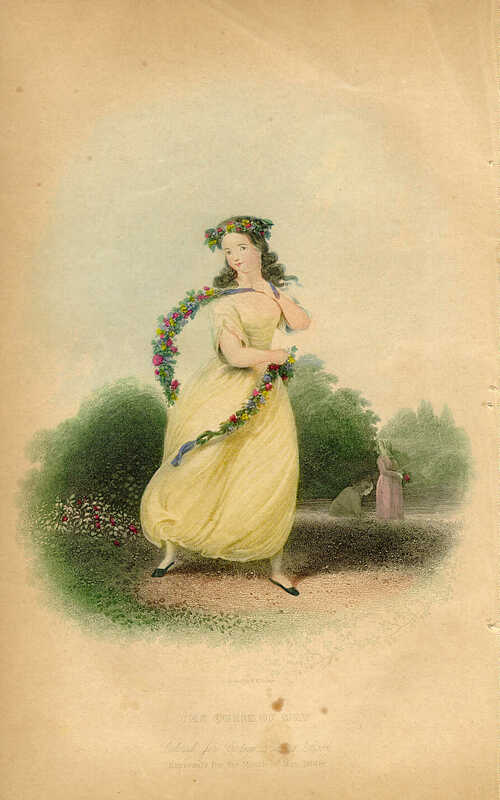 Nevertheless, as this is, as Alfred, Lord Tennyson says, “the maddest merriest day” of all the year, Mrs Daffodil wishes you all a very happy May Day. This entry was posted in Children, Frolics, Holidays, News and Announcements, Victorian and tagged anglophilia, May Day, May Queen, monarchy on May 1, 2013 by chriswoodyard.